Like investing in a residential solar system, there are other adjustments you can make around the house to save energy, cut costs, and live a more eco-friendly life. When it comes to wasted energy use, every electrical device in your home contributes. Pretty much anything you plug in, even when it’s turned off, is drawing power at all times. Heating, cooling, water heating, and lighting are your biggest energy vampires, but smaller and more solitary electrical devices like TVs, computers, cell phone chargers, and kitchen appliances eat up your energy, too. Your DVR? That consumes about 49 watts of power even while turned off. 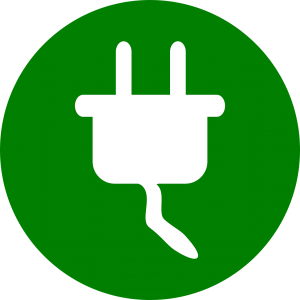 A single cell phone charger draws about 1 watt without a phone plugged into it, and up to 8 watts of power when charging a phone. Over time, this adds up! Consider how you might unknowingly use energy. When not in use, unplug your electronics, or consider investing in an environmentally-friendly power strip like the Smart Strip, which cuts power to plugged-in appliances once you turn them off. Alter your habits today, and in time you could save up to 10% on your electrical bill. Don’t take your air conditioning unit for granted. Regularly clean and replace dirty filters, and ensure all vents and returns are clean and unobstructed. Take a look at your unit outside, too. Is it clogged by any dirt, leaves, or mud? This can happen quickly and easily in all seasons—rain, wind, and falling leaves add up. Once a year, hire a certified HVAC technician to do an all-over inspection and cleaning. Replacing a dirty filter alone can cut your energy usage by more than 5%, and checking on your unit regularly takes less than 10 minutes. We all love sunlight, but—especially if you’re not home during the day—it pays to keep the inside of your house shaded. Closing blinds during the day is a simple way to prevent the sun’s rays from heating your home unnecessarily. Check the south- and west-facing sides of your home first. Once the sun really starts to shine, close your blinds. Even a little helps. Consider adding curtains, shutters, or awnings to save even more. If you don’t already compost, you’ve probably considered it. And for good reason—composting not only saves landfill space, it cuts methane production, creates healthy fertilizer for your garden, and costs you next to nothing. Every day, we toss items that could instead be composted and used; food leftovers and yard waste make up 20-30% of our “trash.” To learn more about how you can compost, check out this free guide published by the EPA. If there’s any lesson to be learned from this post, it’s that every small action counts. We all love to stay cool in the summer and stay warm in the winter, and if you have an AC unit you probably keep it at a set temperature all the time. Experiment with that. In the summer, turn your setting up one or two degrees; in the winter, one or two down. Keep ceiling fans circulating air. Your body will adjust and you won’t sacrifice comfort, but you’ll save some energy and extend the life of your appliances. A greener life is just around the corner! Start today.